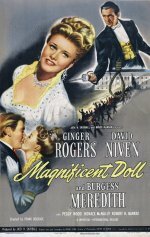 Biographical drama, starring Ginger Rogers and David Niven. America in the late 18th century. When her first husband dies, Dolly Payne and her mother open a boarding house in the Washington area, where Dolly is courted by two men active in politics - Aaron Burr, a charming scoundrel, and the philosophical James Madison, later to become president of the United States.